Francine Stock talks to Meryl Streep about her Oscar-nominated role in August: Osage County. Plus Oscar Isaac on working with the Coen Brothers in Inside Llewyn Davis. 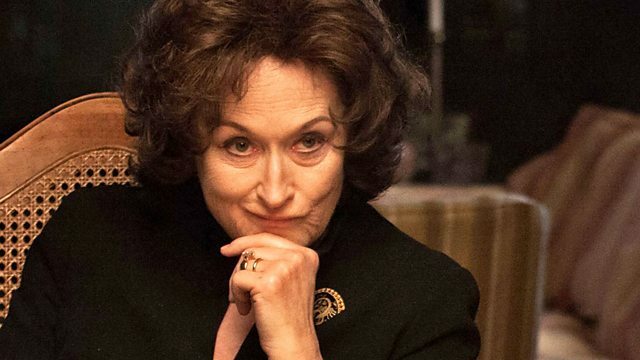 Francine Stock talks to Meryl Streep about her role as vicious matriarch in August: Osage County, based on a widely-praised play by Tracy Letts. Streep has picked up a record 18th Oscar nomination for the part, starring alongside Julia Roberts, Ewan McGregor and Juliette Lewis. The plot follows a family gathering to bury the head of the family after his suicide. Meryl describes how she revels in the freedom of playing a character without limits and discusses her next project Into the Woods, which has been filming in Richmond Park, London. The National Trust provides a surprisingly diverse range of film locations from elf cottages to Russian love nests. Film Unit Manager Harvey Edgington shows us around, including Ham House which has featured in Anna Karenina and A Little Chaos. Plus Oscar Isaac on playing a failing folk musician in the latest offering from the Coen Brothers, Inside Llewyn Davis. He explains why it was so important to play the music live himself and why it's never fun working with cats.. The critic Catherine Bray picks up on the highlights of the Sundance Festival which aims to promote the best of independent film making. She praises Frank, starring Michael Fassbender, The Trip to Italy the new outing from Rob Brydon and Steve Coogan as well as Skeleton Twins, starring Kristen Wiig. Multi-award winning actor Meryl Streep on The French Lieutenant’s Woman and her career. Can you figure out the scary film's name from just a brief description of a famous scene? In space, no one can hear you get all the answers wrong. How well do you know the films featuring the red planet? How well do you know the opening lines to iconic films? Test your knowledge here.